Pille of Nami-Nami just posted about these amazing cookies, and I had to try them. Three ingredients? Really? Just bananas, oats and whatever mix-ins you want? It kind of sounds too good to be true, but alas, it is true. They really do work. 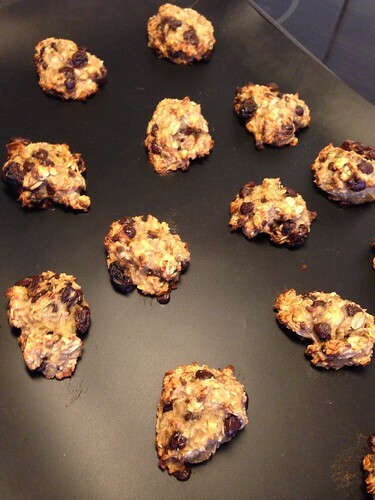 Being a constant rule-breaker, I couldn't decide on just ONE mix-in, so I used a few spoonfuls each of raisins and dark chocolate, and they turned out great! They're so quick to make, and really quite reasonably healthy. Success! Mix everything together, and shape small balls on a cookie sheet. Bake at 175°C for about 15 minutes, until lightly golden. So great to hear that you liked them! What about the boys? Pille, Titus wasn't interested at all - he tried a small nibble, then decided that no, not for him. Dante liked them,but I quickly regretted adding chocolate since it turned out to be pretty messy :-) I'll make another batch for him though, but not so sure what I'll use for mix-ins.. maybe tiny raisins, and.. hm, coconut? Ours have loved the simple raisin versions (I prefer using the tiny currant raisins, korinter); the batch with dried cranberries and some grated orange zest was also very popular.